For other uses, see Dodona (disambiguation). Dodona (/doʊˈdoʊnə/; Doric Greek: Δωδώνα, Dōdṓna, Ionic and Attic Greek: Δωδώνη, Dōdṓnē) in Epirus in northwestern Greece was the oldest Hellenic oracle, possibly dating to the second millennium BCE according to Herodotus. The earliest accounts in Homer describe Dodona as an oracle of Zeus. Situated in a remote region away from the main Greek poleis, it was considered second only to the oracle of Delphi in prestige. During classical antiquity, according to various accounts, priestesses and priests in the sacred grove interpreted the rustling of the oak (or beech) leaves to determine the correct actions to be taken. According to a new interpretation, the oracular sound originated from bronze objects hanging from oak branches and sounded with the wind blowing, similar to a wind chime. According to Nicholas Hammond, Dodona was an oracle devoted to a Mother Goddess (identified at other sites with Rhea or Gaia, but here called Dione) who was joined and partly supplanted in historical times by the Greek deity Zeus. Although the earliest inscriptions at the site date to c. 550–500 BCE, archaeological excavations conducted for more than a century have recovered artifacts as early as the Mycenaean era, many now at the National Archaeological Museum of Athens, and some in the archaeological museum at nearby Ioannina. There was an ancient tradition that Dodona was founded as a colony from the city, also named Dodona, in Thessaly. Cult activity at Dodona was already established in some form during the Late Bronze Age (or Mycenaean period). During the post-Mycenaean period (or "Greek Dark Ages"), evidence of activity at Dodona is scant, but there is a resumption of contact between Dodona and southern Greece during the Archaic period (8th century BCE) with the presence of bronze votive offerings (i.e. tripods) from southern Greek cities. Archaeologists also have found Illyrian dedications and objects that were received by the oracle during the 7th century BCE. Until 650 BCE, Dodona was a religious and oracular centre mainly for northern tribes: only after 650 BCE did it become important for the southern tribes. Zeus was worshipped at Dodona as "Zeus Naios" or "Naos" (god of the spring below the oak in the temenos or sanctuary, cf. Naiads) and as "Zeus Bouleus" (Counsellor). According to Plutarch, the worship of Jupiter (Zeus) at Dodona was set up by Deucalion and Pyrrha. The earliest mention of Dodona is in Homer, and only Zeus is mentioned in this account. In the Iliad (circa 750 BCE), Achilles prays to "High Zeus, Lord of Dodona, Pelasgian, living afar off, brooding over wintry Dodona" (thus demonstrating that Zeus also could be invoked from a distance). No buildings are mentioned, and the priests (called Selloi) slept on the ground with unwashed feet. No priestesses are mentioned in Homer. The oracle also features in another passage involving Odysseus, giving a story of his visit to Dodona. Odysseus's words "bespeak a familiarity with Dodona, a realization of its importance, and an understanding that it was normal to consult Zeus there on a problem of personal conduct." The details of this story are as follows. Odysseus says to the swineherd Eumaeus (possibly giving him a fictive account) that he (Odysseus) was seen among the Thesprotians, having gone to inquire of the oracle at Dodona whether he should return to Ithaca openly or in secret (as the disguised Odysseus is doing). Odysseus later repeats the same tale to Penelope, who may not yet have seen through his disguise. According to some scholars, Dodona was originally an oracle of the Mother Goddess attended by priestesses. She was identified at other sites as Rhea or Gaia. The oracle also was shared by Dione (whose name simply means "deity"). By classical times, Dione was relegated to a minor role elsewhere in classical Greece, being made into an aspect of Zeus's more usual consort, Hera — but never at Dodona. Many dedicatory inscriptions recovered from the site mention both "Dione" and "Zeus Naios". According to some archaeologists, not until the 4th century BCE, was a small stone temple to Dione added to the site. By the time Euripides mentioned Dodona (fragmentary play Melanippe) and Herodotus wrote about the oracle, the priestesses appeared at the site. A map of the main sanctuaries in Classical Greece. Though it never eclipsed the Oracle of Apollo at Delphi, Dodona gained a reputation far beyond Greece. In the Argonautica of Apollonius of Rhodes, a retelling of an older story of Jason and the Argonauts, Jason's ship, the "Argo", had the gift of prophecy, because it contained an oak timber spirited from Dodona. In c. 290 BCE, King Pyrrhus made Dodona the religious capital of his domain and beautified it by implementing a series of construction projects (i.e. grandly rebuilt the Temple of Zeus, developed many other buildings, added a festival featuring athletic games, musical contests, and drama enacted in a theatre). A wall was built around the oracle itself and the holy tree, as well as temples to Dione and Heracles. In 219 BCE, the Aetolians, under the leadership of General Dorimachus, invaded and burned the temple to the ground. During the late 3rd century BCE, King Philip V of Macedon (along with the Epirotes) reconstructed all the buildings at Dodona. In 167 BCE, Dodona was destroyed by the Romans (led by Aemilius Paulus), but was later rebuilt by Emperor Augustus in 31 BCE. By the time the traveller Pausanias visited Dodona in the 2nd century CE, the sacred grove had been reduced to a single oak. In 241 CE, a priest named Poplius Memmius Leon organized the Naia festival of Dodona. In 362 CE, Emperor Julian consulted the oracle prior to his military campaigns against the Persians. Pilgrims still consulted the oracle until 391-392 CE when Emperor Theodosius closed all pagan temples, banned all pagan religious activities, and cut down the ancient oak tree at the sanctuary of Zeus. Although the surviving town was insignificant, the long-hallowed pagan site must have retained significance for Christians given that a Bishop Theodorus of Dodona attended the First Council of Ephesus in 431 CE. Plan of the sanctuary, as it developed up to the Roman period. #16 on this map is the Christian Basilica that occupies the site of the former Zeus temple. Herodotus (Histories 2:54–57) was told by priests at Egyptian Thebes in the 5th century BCE "that two priestesses had been carried away from Thebes by Phoenicians; one, they said they had heard was taken away and sold in Libya, the other in Hellas; these women, they said, were the first founders of places of divination in the aforesaid countries." The simplest analysis of the quote is: Egypt, for Greeks as well as for Egyptians, was a spring of human culture of all but immeasurable antiquity. This mythic element says that the oracles at the oasis of Siwa in Libya and of Dodona in Epirus were equally old, but similarly transmitted by Phoenician culture, and that the seeresses – Herodotus does not say "sibyls" – were women. that two black doves had come flying from Thebes in Egypt, one to Libya and one to Dodona; the latter settled on an oak tree, and there uttered human speech, declaring that a place of divination from Zeus must be made there; the people of Dodona understood that the message was divine, and therefore established the oracular shrine. The dove which came to Libya told the Libyans (they say) to make an oracle of Ammon; this also is sacred to Zeus. Such was the story told by the Dodonaean priestesses, the eldest of whom was Promeneia and the next Timarete and the youngest Nicandra; and the rest of the servants of the temple at Dodona similarly held it true. In the simplest analysis, this was a confirmation of the oracle tradition in Egypt. The element of the dove may be an attempt to account for a folk etymology applied to the archaic name of the sacred women that no longer made sense and the eventual connection with Zeus, justified by a tale told by a priestess. Was the pel- element in their name connected with "black" or "muddy" root elements in names like "Peleus" or "Pelops"? Is that why the doves were black? But my own belief about it is this. If the Phoenicians did in fact carry away the sacred women and sell one in Libya and one in Hellas, then, in my opinion, the place where this woman was sold in what is now Hellas, but was formerly called Pelasgia, was Thesprotia; and then, being a slave there, she established a shrine of Zeus under an oak that was growing there; for it was reasonable that, as she had been a handmaid of the temple of Zeus at Thebes, she would remember that temple in the land to which she had come. After this, as soon as she understood the Greek language, she taught divination; and she said that her sister had been sold in Libya by the same Phoenicians who sold her. I expect that these women were called 'doves' by the people of Dodona because they spoke a strange language, and the people thought it like the cries of birds; then the woman spoke what they could understand, and that is why they say that the dove uttered human speech; as long as she spoke in a foreign tongue, they thought her voice was like the voice of a bird. For how could a dove utter the speech of men? The tale that the dove was black signifies that the woman was Egyptian. Thesprotia, on the coast west of Dodona, would have been available to the seagoing Phoenicians, whom readers of Herodotus would not have expected to have penetrated as far inland as Dodona. This oracle, according to Ephorus, was founded by the Pelasgi. And the Pelasgi are called the earliest of all peoples who have held dominion in Greece. In ancient times, then, Dodona was under the rule of the Thesprotians; and so was Mount Tomaros, or Tmaros (for it is called both ways), at the base of which the temple is situated. And both the tragic poets and Pindaros have called Dodona 'Thesprotian Dodona.' But later on it came under the rule of the Molossoi. At the outset, it is true, those who uttered the prophecies were men (this too perhaps the poet indicates, for he calls them “hypophetae” [interpreters] and the prophets might be ranked among these), but later on three old women were designated as prophets, after Dione also had been designated as temple-associate of Zeus. Among the Thesprotians and the Molossians old women are called "peliai" and old men "pelioi," as is also the case among the Macedonians; at any rate, those people call their dignitaries "peligones" (compare the gerontes among the Laconians and the Massaliotes). And this, it is said, is the origin of the myth about the pigeons [peleiades] in the Dodonaean oak-tree. According to Sir Richard Claverhouse Jebb, the epithet Neuos of Zeus at Dodona primarily designated "the god of streams, and, generally, of water". Jebb also points out that Achelous, as a water deity, received special honours at Dodona. The area of the oracle was quite swampy, with lakes in the area and reference to the "holy spring" of Dodona may be a later addition. Jebb mostly follows Strabo in his analysis. Accordingly, he notes that the Selloi, the prophets of Zeus, were also called tomouroi, which name derived from Mount Tomares. Tomouroi was also a variant reading found in the Odyssey. According to Jebb, the Peleiades at Dodona were very early, and preceded the appointment of Phemonoe, the prophetess at Delphi. The introduction of female attendants probably took place in the fifth century. The timing of change is clearly prior to Herodotus (5th century BC), with his narrative about the doves and Egypt. 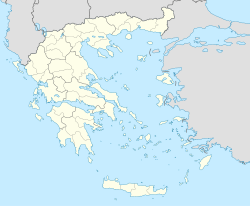 Aristotle (Meteorologica, 1.14) places 'Hellas' in the parts about Dodona and the Achelous and says it was inhabited by "the Selloi, who were formerly called Graikoi, but now Hellenes." The alternative reading of Selloi is Helloi. Aristotle clearly uses "Dodona" as the designation of the whole district in which the oracle was situated. Thus, according to some scholars, the origin of the words "Hellenes" and "Hellas" was from Dodona. Also, the word "Greece" may have been derived from this area. ^ Liddell & Scott 1996, "Dodone"
^ a b Hammond 1986, p. 77; Aristotle. Meteorologica. 1.14. ^ Potter 1751, Chapter VIII, "Of the Oracles of Jupiter", p. 265. ^ Harissis, Haralambos. "A Bronze Wheel from Dodona. The Iynx, the Cauldron and the Music of the Gods". ^ Hammond 1986, p. 39: "...Greek gods too, especially Zeus the sky-god, were at home on Mt. Olympus and in Pieria, and the Zeus of Dodona derived his importance from the Bronze Age when he displaced a Mother Goddess and assimilated her as Aphrodite." ^ Lhôte 2006, p. 77. ^ Eidinow 2014, pp. 62–63; Tandy 2001, p. 23. ^ Stephanus of Byzantium. Ethnica. sub voce Δωδώνη. ^ a b Eidinow 2014, pp. 62–63: "There appears to be evidence for contact between Epirus and Mycenean culture from the early and middle Bronze Age (mostly ceramic), with most evidence dating to the late Bronze Age and including as well as pottery remains, weaponry (swords and double-axes), tools and jewellery, and imports from the Europe and the Near East. Objects and archaeological remains at the site of Dodona suggest that there was already some kind of cult activity there in the late Bronze Age. There is little evidence for the Dark Age period (1200/1100-730/700 BC), but contact between the area and cities in South Greece seems to resume in the eighth century (with the foundation of Kassopeia in 730-700 BC by Elis, and settlements by Corinth, including Ambracia, Anaktorion Epidamnus and Apollonia, 650/630 BC); and this is supported by the appearance at Dodona of bronze votive offerings from the south of Greece, dating to the end of the eighth century, and beginning with the pervasive tripod, but going on through the archaic period to encompass a variety of animal, human and divine imagery." ^ Boardman 1982, p. 653; Hammond 1976, p. 156. ^ Boardman 1982, pp. 272–273. ^ Kristensen 1960, p. 104; Tarn 1913, p. 60. ^ Plutarch. Parallel Lives, Pyrrhus. ^ a b Sacks, Murray & Bunson 1997, "Dodona", p. 85. ^ Gwatkin, Jr. 1961, p. 100. ^ Vandenberg 2007, p. 29. ^ Dakaris 1971, p. 46; Wilson 2006, p. 240; Sacks, Murray & Bunson 1997, "Dodona", p. 85. ^ Sacks, Murray & Bunson 1997, "Dodona", p. 85; Dakaris 1971, p. 46. ^ Sacks, Murray & Bunson 1997, "Dodona", p. 85; Dakaris 1971, p. 62. ^ a b Pentreath 1964, p. 165. ^ Pausanias. Description of Greece, 1.18. ^ Dakaris 1971, p. 26. ^ Dakaris 1971, p. 26; Fontenrose 1988, p. 25. ^ Flüeler & Rohde 2009, p. 36. ^ Vandenberg 2007, pp. 29–30. ^ a b c Strabo. Geography, 7.7. ^ Strabo. Fragments, Book VII. ^ This was the name of the senators at Sparta, meaning 'the elders'. ^ The similarity of these two words is pointed out here. ^ a b Jebb 1892, Appendix, p. 202, Note #4. ^ Eidinow 2014, p. 64: "But from the fifth century the sanctuary appears to have been managed by priestesses, and this may indicate some sort of reorganization in the intervening period." ^ a b Guest 1883, p. 272. Boardman, John (1982). The Expansion of the Greek World, Eighth to Sixth Centuries B.C. Cambridge, UK: Cambridge University Press. ISBN 0-521-23447-6. Boardman, John (1982). The Prehistory of the Balkans and the Middle East and the Aegean World, Tenth to Eighth Centuries B.C. Cambridge, UK: Cambridge University Press. ISBN 0-521-22496-9. Eidinow, Esther (2014). "Oracles and Oracle-Sellers. An Ancient Market in Futures". In Engles, David; Van Nuffelen, Peter (eds.). Religion and Competition in Antiquity. Brussels: Éditions Latomus. pp. 55–95. Flüeler, Christoph; Rohde, Martin (2009). Laster im Mittelalter/Vices in the Middle Ages. New York, NY and Berlin, Germany: Walter de Gruyter. ISBN 3-11-020274-3. Fontenrose, Joseph Eddy (1988). Didyma: Apollo's Oracle, Cult, and Companions. Berkeley and Los Angeles, CA: University of California Press. ISBN 0-520-05845-3. Guest, Edwin (1883). Origines Celticae. London: Macmillan and Co.
Gwatkin, Jr., William E. (1961). "Dodona, Odysseus, and Aeneas". The Classical Journal. 57 (3): 97–102. Hammond, Nicholas Geoffrey Lemprière (1986). A History of Greece to 322 B.C. Oxford, UK: Clarendon Press. ISBN 0-19-873096-9. Hammond, Nicholas Geoffrey Lemprière (1976). Migrations and Invasions in Greece and Adjacent Areas. Park Ridge, NJ: Noyes Press. ISBN 0-8155-5047-2. Jebb, Richard Claverhouse (1892). Sophocles: The Plays and Fragments (Part V. The Trachiniae). Cambridge: Cambridge University Press. Kristensen, William Brede (1960). The Meaning of Religion: Lectures in the Phenomenology of Religion. The Hague, The Netherlands: M. Nijhoff. Lhôte, Éric (2006). Les Lamelles Oraculaires de Dodone. Genève, Switzerland: Librairie Droz. ISBN 2-600-01077-7. Liddell, Henry George; Scott, Robert (1996) . A Greek-English Lexicon. Oxford, UK: Clarendon Press. ISBN 0-19-864226-1. Pentreath, Guy (1964). Hellenic Traveller: A Guide to the Ancient Sites of Greece. London, UK: Faber and Faber. ISBN 0-571-09718-9. Potter, John (1751). Archaeologia Graeca or the Antiquities of Greece. I. London, UK: Printed for G. Strahan, R. Ware, W. Innys, J. and P. Knapton, S. Birt, D. Browne, H. Whitridge, T. Longman, C. Hitch, J. Hodges, B. Barker, R. Manry and S. Cox, J. Whiston, J. and J. Rivington, J. Ward, M. Cooper, and M. Austen. Sacks, David; Murray, Oswyn; Bunson, Margaret (1997). A Dictionary of the Ancient Greek World. New York, NY and Oxford, UK: Oxford University Press. ISBN 0-19-511206-7. Tarn, William Woodthorpe (1913). Antigonos Gonatas. Oxford, United Kingdom: Clarendon Press. ISBN 0-8244-0142-5. Vandenberg, Philipp (2007). Mysteries of the Oracles: The Last Secrets of Antiquity. New York, NY: Tauris Parke Paperbacks (I.B. Tauris). ISBN 1-84511-402-7. Wilson, Nigel Guy (2006). Encyclopedia of Ancient Greece. New York, NY and Oxford, UK: Taylor & Francis Group (Routledge). ISBN 978-0-415-97334-2. Christidēs, Anastasios-Phoivos; Arapopoulou, Maria; Chritē, Maria (2007). A History of Ancient Greek: From the Beginnings to Late Antiquity. Cambridge, United Kingdom: Cambridge University Press. ISBN 0-521-83307-8. Easterling, P. E.; Muir, John Victor (1985). Greek Religion and Society. Cambridge, United Kingdom: Cambridge University Press. ISBN 0-521-28785-5. Eidinow, Esther (2007). Oracles, Curses, & Risk Among the Ancient Greeks. Oxford, United Kingdom: Oxford University Press. ISBN 0-199-27778-8. Marinatos, Nanno; Hägg, Robin (1993). Greek Sanctuaries: New Approaches. New York, New York and Oxford, Great Britain: Routledge. ISBN 0-415-05384-6. Wikimedia Commons has media related to Dodona. A. E. Housman, "The Oracles"
C. E. Witcombe, "Sacred Places: Trees and the Sacred"
Harry Thurston Peck (1898). Harper's Dictionary of Classical Antiquities, s.v. "Dodona". This page was last edited on 29 March 2019, at 18:51 (UTC).